This camp is PERFECT preparation for any of the Haute Route Epics and for anyone who wants to get in some quality climbing. 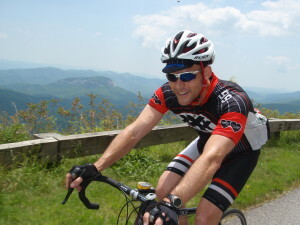 We’ve had IM Athletes use this camp to get ready for their target event as well as numerous road riders who want to supercharge their preparation for their target events or just enjoy 4 amazing days riding in the Mountains of Western North Carolina. Climbing is the theme of this camp as we average nearly 10,000 feet of climbing for each of the first three days. We ascend Mt. Mitchell (highest peak east of the Rocky Mountains) as well as Mt. Pisgah and several other extraordinary ascents (and descents). Even with all of the vertical gain, however, we still have plenty of group riding and have had a wide variety of ability levels thoroughly enjoy this camp in previous years. Just in case, professional support accompanies every ride. If you are flying to camp, you will purchase your airline tickets on your own.